There is nothing Pavel Datsyuk can’t do on a sheet of ice. He is strong his skates, possesses a great shot and is a terrific passer. I’ve heard his speed knocked at times. I find the criticism to be without merit. It’s not like he is slow. He is not a fighter per say, but he does body check consistently with force. And the one time he did fight, he won a spirited decision over Anaheim’s Corey Perry. 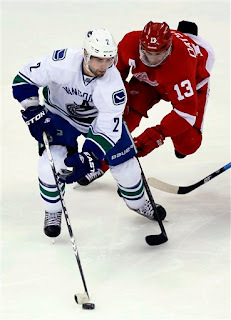 But there are two aspects of the game that standout about Datsyuk more than others. One, he is the best stickhandler I have ever seen. It's artistic the way he can drag the puck. Another, he is amazingly proficient at taking the puck off opposing players on the forecheck. He literally does those two things as well as anybody who has ever played the game. Datsyuk has agreed to remain in Detroit the next three seasons. The fear he would play out his contract next season and then return to Russia proved to be unfounded. With captain Henrik Zetterberg, goalie Jimmy Howard and Datsyuk in the fold, and a developing young group surrounding them, the Red Wings should be legitimate contenders to capture the Stanley Cup championship for years to come. There is not sign he slow down in his mid-30s.